Students and teachers of the gymnasium must have liked posing for pictures in the gymnasium’s courtyard, which is currently a place near the VGSJM library. The picture is taken in 1925. On the reverse side, it bears the following inscription in Hebrew: ‘Wind orchestra of Vilnius Epstein Jewish Gymnasiumwith Hebrew as the language of instruction. 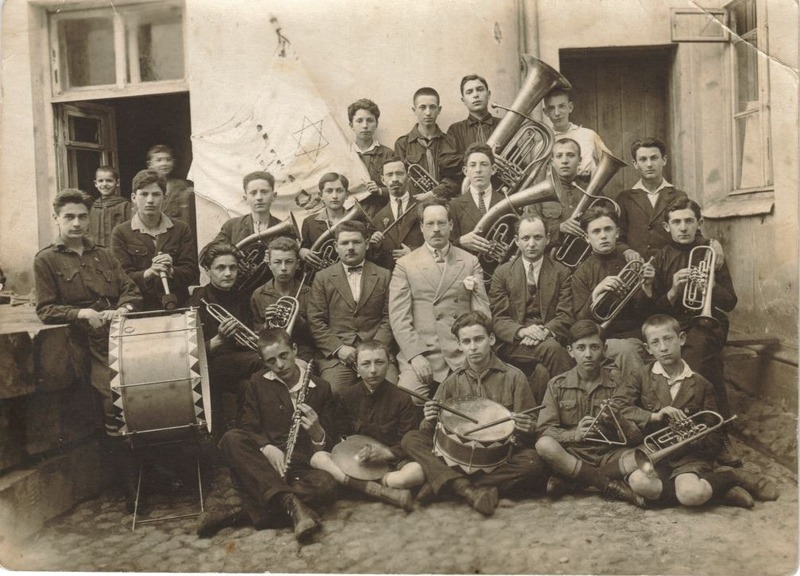 Vilnius, 1925.’ In the second row: second from the right is student Oszer Szapiro, fourth from the right is the gymnasium’s headmaster Dr Yosef Regensburg. Oszer Szapiro (born in 1909) studied at the gymnasium from 1921 to 1927. The Museum’s collection contains the graduation certificate issued on 20 June 1927 to Oszer Szapiro, a graduate of Vilnius Epstein Jewish Private Gymnasium (with Hebrew as the language of instruction), whose studies were mainly in the humanities. In 1915 Yosef Epstein established a Jewish gymnasium in Vilnius with Hebrew as the language of instruction. In spring 1916 the gymnasium rented premises on Pylimo St. 4. The gymnasium occupied 18 rooms and 2 halls on the second and third floors. The founder and the first headmaster of the gymnasium Yosef Epstein died in the summer of 1916 during an outbreak of typhus fever. The gymnasium was named after him. In 1916–1928 Vilnius Epstein Jewish Gymnasium was headed by Yosef Regensburg. In 1921 the gymnasium had 400 students. In 1936 there were around 500 students and 25 teachers in the gymnasium. In the 1920s the Tarbut (Hebrew – culture) organisation became the patron of the gymnasium and it was named the Tarbut gymnasium. The Tarbut gymnasium stayed open till the summer of 1940. When the Soviets came, the Tarbut organisation was closed down and the building of the gymnasium was nationalised. As of 1 September 1940 Secondary Jewish School No. 13 with Yiddish as the language of instruction started operating in the building of the former Tarbut gymnasium. A year later the war began. The Jewish school was closed down and never reopened in the same building. Currently the premises at Pylimo St. 4 are occupied by the Lithuanian Jewish (Litvak) Community and a branch of the VGSJM, that is, the future Museum of Litvak Culture and Identity.